I am still on the lookout for a round punch bowl so I can recreate this cute snowman punch bowl idea, but until then I can serve eggnog in these cute snowmen cups from Kitchen Concoctions. They would be even easier to create with clear plastic cups and some sharpies. 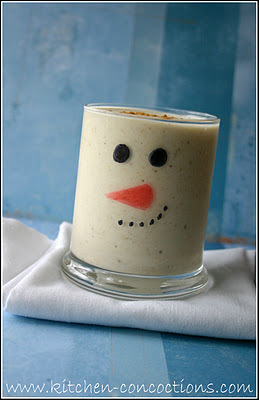 And if you aren't an eggnog fan, you could use the idea for a snowman smoothie. 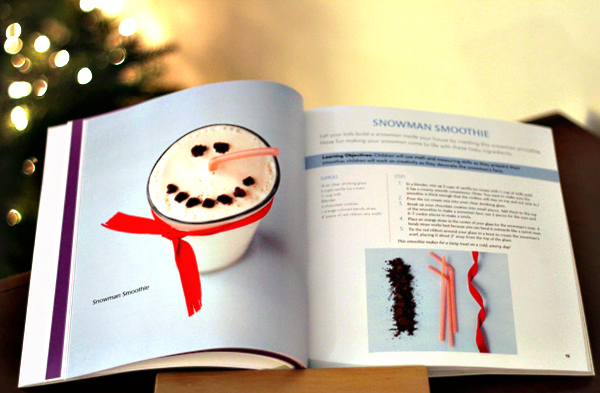 Another fun snowman smoothie idea is this one from the new Make and Takes for Kids book I saw over at Modern Parents Messy Kids. This idea would work for eggnog too. I like raisins, but I wonder if chocolate chips will float in eggnog?